Tips When Buying a New A/C System in Brevard County, Florida - Serving Melbourne, Titusville, Palm Bay and surrounding areas. This website was designed to educate anyone interested in purchasing a new air conditioning system in the Melbourne Florida area. If you are in Brevard County we would be happy to come out and evaluate your situation, offer you a solution and give you a free estimate. We give return calls usually in less than one hour. (1)	What is your long term plan for the house? If you plan on staying in your home for ten or more years it is a better investment to buy the highest efficiency system available. High efficiency is a system that has a two stage compressor on the outside and variable speed blower on the inside. It costs more out of pocket money but your saving over ten years will pay you back 100% and there is always a free finance plan available. If your plan is to move in a couple of years go with a system that is in the 14-15 seer range and has a variable speed motor. If this is a rental or you are trying to sell the house buy an affordable 13 seer, but go with a pro brand such as Trane, Maytag, Amana and Carrier. If the rental has a dial type thermostat, request a digital, this is the one thing the tenant looks at every day. If you live by the coastline get a coastal model (one that has a treated coil). (2)	Do your homework on the company you have installing the unit. If the air conditioner is installed wrong it will cost you more in the long run. Make sure the company you buy from has quality around the clock service. Try to find a company that is clean cut and has factory trained, authorized dealer of the brand you want. They must have NATE (North American Technician Excellence) certified techs. This is the highest certification for a service tech, it is hard to get certified and it means they have guys that really know what they are doing. You do not want to hire your neighbor or the company no one has ever heard of, and just because the unit they installed blows ice cold doesn’t mean it’s installed correctly. The estimator should check duct work and make sure the system is circulating correctly and all vents have very good flow. His proposal should be accurate and all actions described clearly. It sounds like a long process but with enough notes the install should be a breeze and should be completed in one day. If something goes wrong with your central a/c installation you will want someone to be accountable. Make sure the thermostat is digital not a dial type and easy to control. Like an appliance you should expect a minimum of 8 to 12 years usage, is the install company going to be around that long? Have the companies been in business four or more years? The majority of new companies go out of business within the first year or during the first cold season, when the weather is cool demand is low here in the southern part of the country. Go by the main office of the HVAC/ refrigeration company you are considering to use. If the business looks run down or messy it is usually a reflection of the type of work they do. (3)	Think about the future, are you considering adding rooms to the house, enclosing the garage etc. If you are, tell your estimator so he can add the accurate amount of tonnage. If your old unit has cooled the house with precision when weather is extremely hot it is probably sized right, if not then this is the time for action, it may be undersized or you may need certified duct modifications. Most of the duct systems I have seen are undersized a few modifications can greatly affect the integrity, efficiency and performance. Black on the air handler is usually a sign that service is needed. Black substance is usually mold and can be of extreme danger to the elderly and children. If the duct system leaks you can be introducing dirt and other toxins to your air stream. Have your duct system pressure checked by an expert (FPL Blower Door Test) and tell your estimator of any rooms with cooling issues. I recommend having the ducts checked after the unit goes in. This gives you a chance to see if any leaks were created with the plumbing of the new central system. Use the palm test around the plenums after installed to check for leaks. Make sure your drain line is made of American made PVC not metal, I try to engineer drain lines directly outside not overhead. The best drain line is a short drain line, there is a ocean of water it dispenses through its life and you can’t have it on your handler deck or in your garage so it should be easy to clean and have a safety over flow switch engineered near the outlet port. 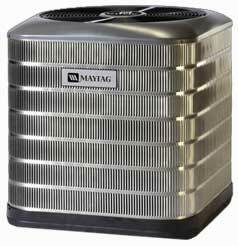 (4)	If you suffer from allergies or have dust issues consider getting an upgraded filter system. If you have to change multiple filters throughout the house consider putting in a central filtering system engineered at the air handler or furnace. All filters should be easy to access and a breeze to change. If the handler is in a garage or attic because of high temp here in the sub tropics and humidity from the sea it is common for mold to be growing in it, have a service done at least once a year. Consider an Ultra Violet Light to control and prevent mold from growing it also kills germs and bacteria, all bulbs have to be changed every year to be effective. This is something you may want to watch in your cool air plenum. With a U.V. Light and air cleaner you can leave your fan circulating even without cooling by turning the fan to on and it will clean the air. All American homes should have these features if anyone suffers from severe allergies or breathing issues, they are very affordable compared to the medicine of today. (5)	If the condenser (outside unit) is in a bad place this is the time to move it. Is your condenser near the pool deck then now is the time to relocate it. If your return grill is by the floor ask your estimator to see if there is room to move it to the ceiling. Hot air rises so it will do a better job of removing the heat and humidity. If on the floor you may be circulating hair and dust. The advantage of a ceiling return far outweighs the cost of re-engineering it. Do it in the winter when the weather is nice it is much harder in the extreme summer heat. (6)	Do you live near the beach or the river in Florida? If you are concerned about your outside A/C condenser holding up against Florida’s harsh environment then you should consider a Corrosion Grenade see below or a coil/cabinet treatment. For people who live near a port or ocean this is ideal protection. Between the climatic sun and salt your outside condenser takes a beating all year long. There is a product that can greatly slow the deterioration process down. Learn more about corrosion protection. Can you imagine waking up to extreme heat and wondering what is going on. You call your air conditioning expert to come out and see why your air conditioner is no longer working. And they have to inform you that your air conditioner has been vandalized, and that the copper and steel parts within the unit have been stolen. There is no longer any hope for the unit. You usually have to replace the whole unit. On the other hand if you had protected yourself with some kind of affordable protection you would not have had this problem. I have seen a drastic increase of copper and aluminum thefts here in the Brevard County area. Recently one of our customers in downtown Melbourne called with a problem. When we got on the roof top we found that thieves had stripped all four of their condensers over the weekend. 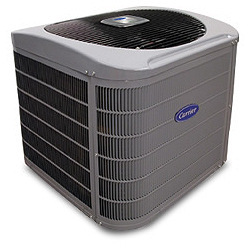 It is cheaper to replace the complete appliance than to replace the condensing coil, fan, compressor and so on. Try replacing four 5 ton condensers, even with economy models the mechanical replacement cost them well over ten thousand dollars. In Florida there is a new trend in mechanical robbery and theft. Because air conditioners have large amounts of clean aluminum and copper and the increased scrap value for these materials, they have become an ideal target for thieves. All of Central Florida has been targeted and the more isolated the house the better the chances of being taken advantage of. New construction areas on the weekends are especially vulnerable, you have multiple specialists and no one person in control of who comes and goes. There are products and services available to protect your condensing unit around the clock such as condenser cages and alarms. This sounds a bit extreme but after spending thousands of dollars on a new appliance and then not securing is asking to be taken advantage of. When metal values increase the more climatic the problem. If you are away from your home for extended periods of time its best to be careful. If your home is in a remote location it’s time to take action with around the clock security and you will have comfort knowing your outside mechanical appliances are safe. Many thieves are stealing units and selling them for their scrap value. What is the solution to this problem? Many air conditioning engineers are using AC cages. Cages make it hard for thieves to get to the unit and they will just go to the next house or business. Any dependable contractor can give you a price. If you don’t have one dial 321-543-2664 for an accurate price today. AC protection was something few Americans thought about a few years ago, but today this type of vandalism can cost thousands of dollars in replacement or repairs. The best thing you can do is get some kind of ac protection and that can either be in the form of ac cages or an ac alarm. The benefit of an ac cage is that they are not as expensive as ac alarms, and cages are much cheaper to install. So many American citizens have been harmed by this type of vandalism, and it has affected everyone, residential, and business alike, even rooftop units have been stolen. Many home owners, businesses and even builders have been affected by these vandals. So have the freedom of knowing your ac unit is safe. Cages can run a few hundred dollars plus installation, which may seem like an unnecessary expense, but when you are faced with having to replace your whole unit because someone has decided to steal the copper core out of it, you will soon realize that the money spent on an ac cage is well worth the investment. There are many distributors of ac cages and they are portable. Plumbing them in is easy you just want a quality cage to be effective. The cages are usually made of some kind of steel or iron work designed to hold up the tough Atlantic Ocean, Space Coast environment. Some cages are even ornamental. They are engineered to allow breathing room for your unit. 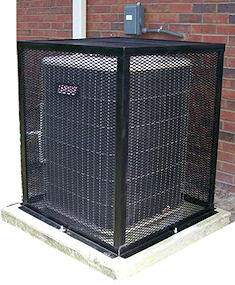 AC cages are not very expensive and yet they give you the freedom of knowing that your AC unit will never be vandalized. Outer Space Coast areas of Palm Bay, Titusville, West Melbourne and Downtown Melbourne have been the hardest hit areas. New construction areas on the weekends are especially vulnerable. You have all kinds of people working these job sights and a large number of construction company’s don’t do background checks. The more metal values increase the more severe the problem. If you are away from your home for extended periods of time you have to be careful, if your home is in a remote area without a fence or a dog you will probably be a target at some point in time. Snow Bird’s that spend months away from their Florida home and don’t have neighbors in sight are the most vulnerable. We offer both commecial and residential HVAC in Central Florida in the following and surrounding areas.